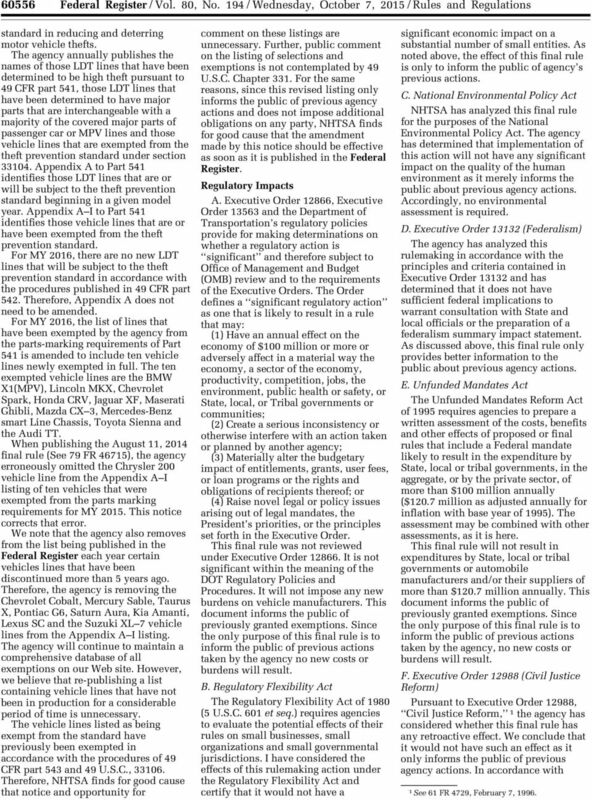 Download "Federal Register / Vol. 80, No. 194 / Wednesday, October 7, 2015 / Rules and Regulations"
2 60556 Federal Register / Vol. 80, No. 194 / Wednesday, October 7, 2015 / Rules and Regulations standard in reducing and deterring motor vehicle thefts. 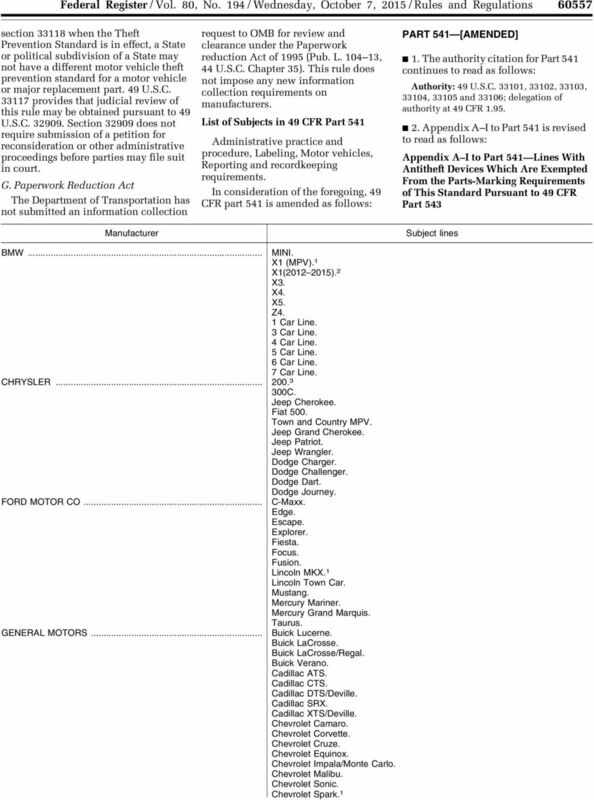 The agency annually publishes the names of those LDT lines that have been determined to be high theft pursuant to 49 CFR part 541, those LDT lines that have been determined to have major parts that are interchangeable with a majority of the covered major parts of passenger car or MPV lines and those vehicle lines that are exempted from the theft prevention standard under section Appendix A to Part 541 identifies those LDT lines that are or will be subject to the theft prevention standard beginning in a given model year. Appendix A I to Part 541 identifies those vehicle lines that are or have been exempted from the theft prevention standard. For MY 2016, there are no new LDT lines that will be subject to the theft prevention standard in accordance with the procedures published in 49 CFR part 542. Therefore, Appendix A does not need to be amended. For MY 2016, the list of lines that have been exempted by the agency from the parts-marking requirements of Part 541 is amended to include ten vehicle lines newly exempted in full. 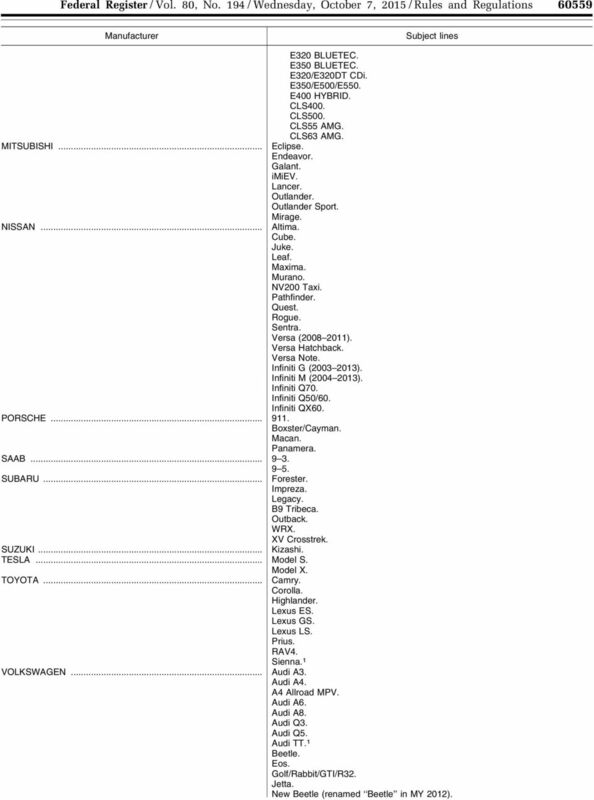 The ten exempted vehicle lines are the BMW X1(MPV), Lincoln MKX, Chevrolet Spark, Honda CRV, Jaguar XF, Maserati Ghibli, Mazda CX 3, Mercedes-Benz smart Line Chassis, Toyota Sienna and the Audi TT. 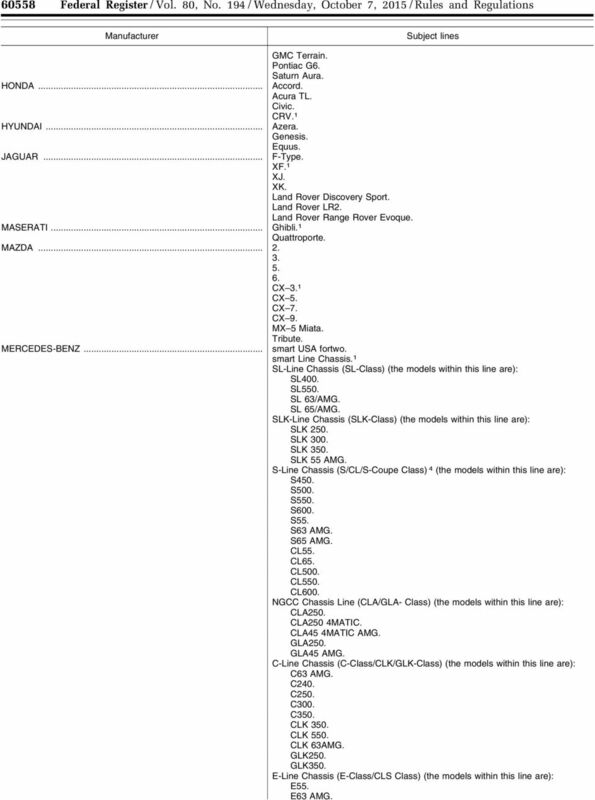 When publishing the August 11, 2014 final rule (See 79 FR 46715), the agency erroneously omitted the Chrysler 200 vehicle line from the Appendix A I listing of ten vehicles that were exempted from the parts marking requirements for MY This notice corrects that error. We note that the agency also removes from the list being published in the Federal Register each year certain vehicles lines that have been discontinued more than 5 years ago. Therefore, the agency is removing the Chevrolet Cobalt, Mercury Sable, Taurus X, Pontiac G6, Saturn Aura, Kia Amanti, Lexus SC and the Suzuki XL 7 vehicle lines from the Appendix A I listing. The agency will continue to maintain a comprehensive database of all exemptions on our Web site. However, we believe that re-publishing a list containing vehicle lines that have not been in production for a considerable period of time is unnecessary. The vehicle lines listed as being exempt from the standard have previously been exempted in accordance with the procedures of 49 CFR part 543 and 49 U.S.C., Therefore, NHTSA finds for good cause that notice and opportunity for comment on these listings are unnecessary. Further, public comment on the listing of selections and exemptions is not contemplated by 49 U.S.C. Chapter 331. 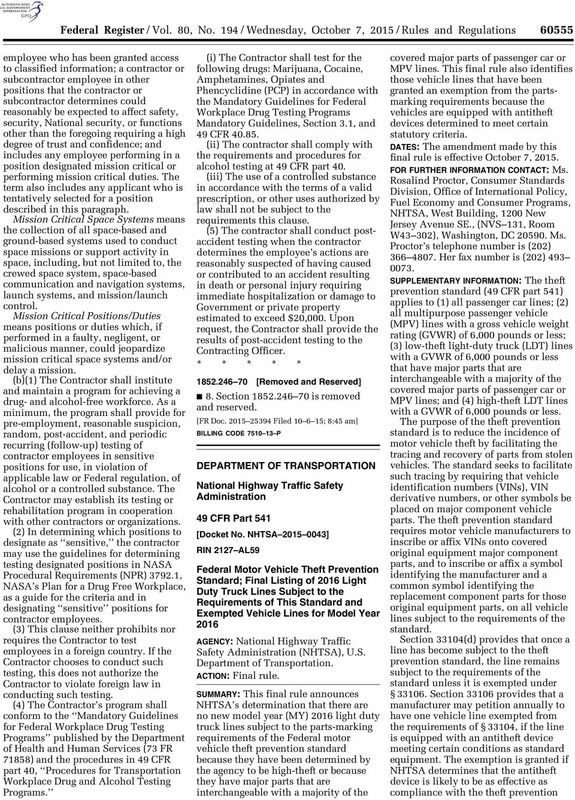 For the same reasons, since this revised listing only informs the public of previous agency actions and does not impose additional obligations on any party, NHTSA finds for good cause that the amendment made by this notice should be effective as soon as it is published in the Federal Register. Regulatory Impacts A. Executive Order 12866, Executive Order and the Department of Transportation s regulatory policies provide for making determinations on whether a regulatory action is significant and therefore subject to Office of Management and Budget (OMB) review and to the requirements of the Executive Orders. The Order defines a significant regulatory action as one that is likely to result in a rule that may: (1) Have an annual effect on the economy of $100 million or more or adversely affect in a material way the economy, a sector of the economy, productivity, competition, jobs, the environment, public health or safety, or State, local, or Tribal governments or communities; (2) Create a serious inconsistency or otherwise interfere with an action taken or planned by another agency; (3) Materially alter the budgetary impact of entitlements, grants, user fees, or loan programs or the rights and obligations of recipients thereof; or (4) Raise novel legal or policy issues arising out of legal mandates, the President s priorities, or the principles set forth in the Executive Order. This final rule was not reviewed under Executive Order It is not significant within the meaning of the DOT Regulatory Policies and Procedures. It will not impose any new burdens on vehicle manufacturers. 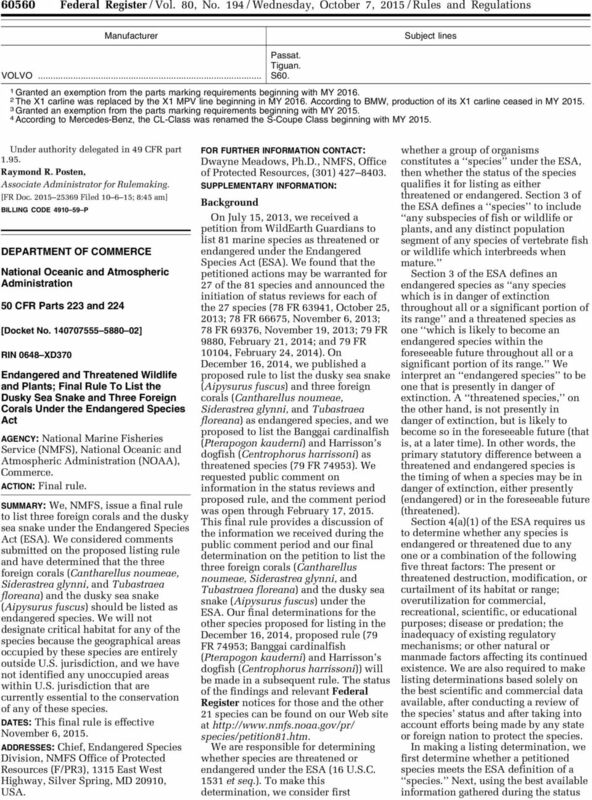 This document informs the public of previously granted exemptions. Since the only purpose of this final rule is to inform the public of previous actions taken by the agency no new costs or burdens will result. B. Regulatory Flexibility Act The Regulatory Flexibility Act of 1980 (5 U.S.C. 601 et seq.) requires agencies to evaluate the potential effects of their rules on small businesses, small organizations and small governmental jurisdictions. I have considered the effects of this rulemaking action under the Regulatory Flexibility Act and certify that it would not have a VerDate Sep<11> :26 Oct 06, 2015 Jkt PO Frm Fmt 4700 Sfmt 4700 E:\FR\FM\07OCR1.SGM 07OCR1 significant economic impact on a substantial number of small entities. As noted above, the effect of this final rule is only to inform the public of agency s previous actions. C. National Environmental Policy Act NHTSA has analyzed this final rule for the purposes of the National Environmental Policy Act. The agency has determined that implementation of this action will not have any significant impact on the quality of the human environment as it merely informs the public about previous agency actions. Accordingly, no environmental assessment is required. D. Executive Order (Federalism) The agency has analyzed this rulemaking in accordance with the principles and criteria contained in Executive Order and has determined that it does not have sufficient federal implications to warrant consultation with State and local officials or the preparation of a federalism summary impact statement. As discussed above, this final rule only provides better information to the public about previous agency actions. E. Unfunded Mandates Act The Unfunded Mandates Reform Act of 1995 requires agencies to prepare a written assessment of the costs, benefits and other effects of proposed or final rules that include a Federal mandate likely to result in the expenditure by State, local or tribal governments, in the aggregate, or by the private sector, of more than $100 million annually ($120.7 million as adjusted annually for inflation with base year of 1995). The assessment may be combined with other assessments, as it is here. This final rule will not result in expenditures by State, local or tribal governments or automobile manufacturers and/or their suppliers of more than $120.7 million annually. This document informs the public of previously granted exemptions. Since the only purpose of this final rule is to inform the public of previous actions taken by the agency, no new costs or burdens will result. F. Executive Order (Civil Justice Reform) Pursuant to Executive Order 12988, Civil Justice Reform, 1 the agency has considered whether this final rule has any retroactive effect. We conclude that it would not have such an effect as it only informs the public of previous agency actions. In accordance with 1 See 61 FR 4729, February 7, 1996. DEPARTMENT OF LABOR Employee Benefits Security Administration 29 CFR Part 2509 RIN 1210-AB22 Amendment to Interpretive Bulletin 95-1 AGENCY: Employee Benefits Security Administration, Department of Labor.